However, stocks took no such beatings when Apple announced it’d be moving deeper into the healthcare industry. The nature of Apple’s move seemed fundamentally different: they announced a beta partnership with 12 leading hospitals across the country to make health records more accessible to the patient. Further, Apple’s existing healthcare page is largely addressed to existing providers and electronic health record (EHR) companies, aiming to bring these providers onto the Apple/iOS platform. If Amazon moves into industry after industry unabashedly, disrupting old-world business models and companies without a second thought, Apple does the opposite. It moves with surgical precision, often partnering with existing players in the industry to redefine how a product is delivered to the end consumer. While Amazon moves into an industry to make new markets, Apple often keeps the existing value chain in tact, simply inserting itself as the owner of the consumer relationship. And with its unparalleled ability to create a beautiful user interface and user experience defined by an integrated hardware and software experience, Apple has come to own the consumer relationship in every market its entered. This understanding of Apple can help us understand how it may be more well-positioned than Amazon to improve the U.S.’s broken healthcare system. When Steve Jobs launched the iTunes Store to give iPod owners a way to easily download and manage music, he wanted to work with the existing large record labels. He’d seen how Napster and its descendants had attempted to win the digital music market — without regard for record label copyrights, accumulating the lawsuits to show. The consummate deal maker, Jobs knew there had to be a better way. At this point, the iPod was already a major success, but Apple wanted a “digital record store”, where iPod users could buy music online. Apple’s goal wasn’t to disrupt the music industry; its simple goal was to sell more iPods. So, Jobs didn’t shirk the record labels — he went to them. He showed a demo of the iTunes Store, negotiating a deal beneficial to both: Jobs got the music his Store needed (and $0.99/ song price he desperately wanted), and the labels got the digital rights management they needed, becoming a partner in the burgeoning digital music business. Shades of this strategy can be now be seen as Apple Music attempts to gain market share on Spotify: short-term exclusives with artists like Taylor Swift, Drake, and Frank Ocean certainly help attract users. “For decades, wireless carriers have treated manufacturers like serfs, using access to their networks as leverage to dictate what phones will get made, how much they will cost, and what features will be available on them. Handsets were viewed largely as cheap, disposable lures, massively subsidized to snare subscribers and lock them into using the carriers’ proprietary services. But the iPhone upsets that balance of power. 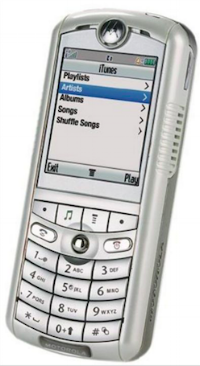 The ROKR was Apple’s attempt to build a mobile phone before the iPhone. We’ve all come a long way. If this quote can’t be applied to the healthcare industry, then I don’t know what can. Low-quality product? Check. Conflicting interests? Check. Consumer as an afterthought? check. And then Apple changed all that. Apple’s Health Records update promises to aggregate a consumer’s health data in one easy-to-access location. In each case, Apple has crafted a way to insert itself (and its hardware) into the value chain between a supplier and the consumer, taking over and owning that consumer relationship. In music, consumers had always bought records or CDs, but they didn’t develop a relationship with the record label. In wireless, consumers may have had a relationship with their carrier, but it was the type of tenuous relationship Drake writes love songs about. Now, Apple is laying the groundwork to do the same in healthcare. With its Health Records announcement, it has paved the way to craft partnerships with health providers and EHRs across the country, creating a platform for patients to better interact with them. 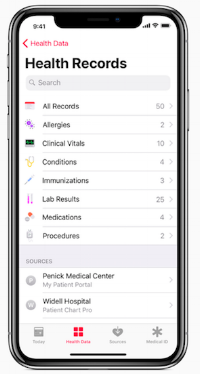 For now, Apple will only push certain information to Health Records: allergies, conditions, immunizations, lab results, medications, procedures and vitals. Additionally, information only flows in one direction. That is, providers can push select EHR data to patients, but patients cannot suggest updates or corrections. Surely, this will evolve as the Health Records platform matures. Similar to the way the iPhone was opened to third-party developers shortly after the its release, third parties will eventually provide the most value for the Health Records platform. For example, genetic tests are mostly reported these days without the genetics company knowing your personal health details. Now, with the clinical information that one can make available on Health Records, one could give permission to third-party apps on the iPhone to access this health data. In industry after industry, Apple has inserted itself between suppliers and consumers, allowing it to own the consumer relationship (and reap massive profits). It will take time for third-party developers to find where the most value can be built on top of the platform, but such is the beauty of an ecosystem. Eventually, patients will be able to add their own information to Health Records, creating the long-desired two-way stream of data and communication between doctors and patients. The iPhone’s messaging and video capabilities create an opportunity for telemedicine to finally take off. With access to Health Records, tele-doctors won’t have to rely on a patient’s recounting of their symptoms or recollection of previous treatments and tests — it’s all right there in the app. Much the way Apple created an all-encompassing ecosystem in music and mobile, it is beginning to do the same in healthcare. For Apple, it means more device sales and consumers locked into the Apple/iOS ecosystem. For consumers, it may finally mean a better user experience when it comes to healthcare.